Why does air power matter to commercial van operators? Why do my van customers need air power? Not all tools are created equal. Tool choice isn’t just a matter of preference, it affects productivity and productivity affects the profitability of every commercial van operator’s business. Pneumatic (or air-powered) tools are usually the choice of mobile mechanics and professionals in construction and utilities. That means that each van sold could potentially need an air compressor. As a seller and/or upfitter of commercial vans, you have an opportunity to help guide customers through the process of specifying the right van and the right equipment for their application. Every pound of weight matters to your customers. Consider the reasons why fleet managers today are turning away from traditional trucks and going with vans. Reducing costs at the pump is a primary reason and unnecessary weight adds costs at the pump. Helping your customer reduce fuel costs is a great way to build the relationship and ensure repeat business. Electric tools are heavy because they carry their own battery. To keep those batteries charged, the van requires a generator or inverter and all of this adds significant weight in the van. Pneumatic tools are lightweight because they don’t have their own power source. Operators simply attach the air supply and get jobs done fast and easy. To reduce the overall weight of the van, install a VMAC UNDERHOOD air compressor and load up with the right pneumatic tools for the job. The VMAC air compressor only adds 85 lbs to the GVW. This combined with the fact that pneumatic tools can weigh half as much as electric tools means that the total vehicle weight can be reduced considerably. According to the Environmental Protection Agency, for every 100 lbs of vehicle weight savings, fuel costs can be reduced by up to 2%. Having a reliable power source is vital to your customers getting jobs done effectively. When workers show up for a job having forgotten to recharge their tools or if batteries drain while working, workers have to stop what they’re doing to change or even charge the batteries. This causes lost productivity and unnecessary labor costs. With a VMAC UNDERHOOD air compressor, workers can get to work immediately, never having to wait for the power they need to get their jobs done. And with the additional power of a rotary screw air compressor, they can tackle even bigger jobs that typically would be left for service trucks. Safety is a priority for anyone in any industry. As we have explored in a previous article (link to gasoline explosion article), pneumatic power is safer than any other source. In addition to the obvious hazards associated with using carrying gasoline inside the van, another health and safety concern is worker Musculoskeletal Injuries (MSIs). MSIs are typically strains, sprains, inflammation and nerve impingement. MSIs can be caused on the job by forces placed on the body including repetition, duration, work postures, contact stress, and vibration. One way to potentially reduce the risk of MSIs is to reduce the weight of tools that workers use on a regular basis. And as we’ve already learned, pneumatic tools can weigh half as much as electric tools. Unfortunately, safety is often a factor that is not given due consideration until it is too late. Help your customers keep their workers safe by understanding their needs and educating them on their options. 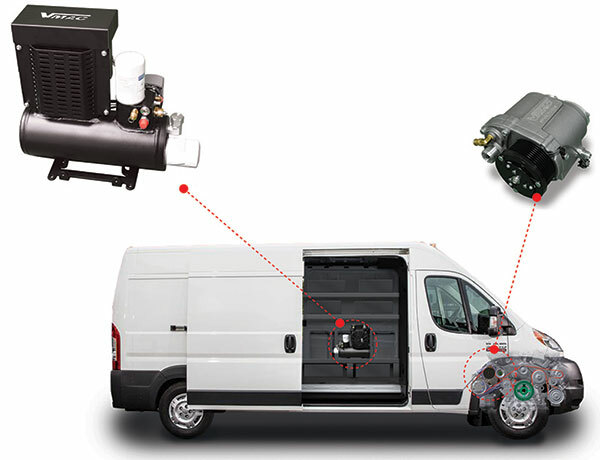 The VMAC UNDERHOOD40 CFM rotary screw mobile air compressor system – Van Series is the only air compressor engineered specifically for commercial vans. VMAC air compressors are designed to solve the biggest challenges facing fleet managers today: weight, costs, productivity, space and most importantly safety.